Today’s installment of “heinous, unacceptable racism disguised as ‘jokes’” features a Republican official on Orange County, California, President Obama, and monkeys in photoshop. 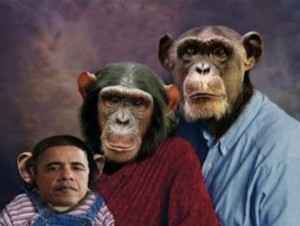 GOP official Marilyn Davenport is coming under fire for sending other Republican officials an email depicting President Obama as a chimpanzee, in the arms of chimpanzee “parents,” claiming, “Now you know why– no birth certificate! [sic].” Davenport is sticking to her guns, blaming the media for making too much of a fuss. It must be too much for Obama and too rude for GOP but heck, if I'd be Obama, I would definitely ignore this one which would just be saying like he doesn't have time to talk to other apes too for he's a busy President.